I read that quote and instantly flashed to my visiting 3 year old grandson. He loves dinosaurs. Everything about them. He will go into a 2 point stance, bend slightly at the waist and throw his arms back and his head up and release the most savage dinosaur roar a young man can muster. It is joyous unrestrained fury! He laughs when he’s done. I can see the T-Rex in him. It’s 100% male fury. It’s infectious. He plays with his older brothers with the same fierceness. Take what is his and he will attack and release the hounds of hell on you. Do him an injustice and he will not sit idly by and wait for help. He acts. I sat wondering how his single mom, his female-dominated school system and gender neutral society will beat this out of him. Don’t get me wrong, social skills are important. Getting along with others to a certain extent is an excellent thing to learn. But crushing the spirit is the end result many times. I saw this cartoon recently and it was a good thing for this young grandfather to remember. 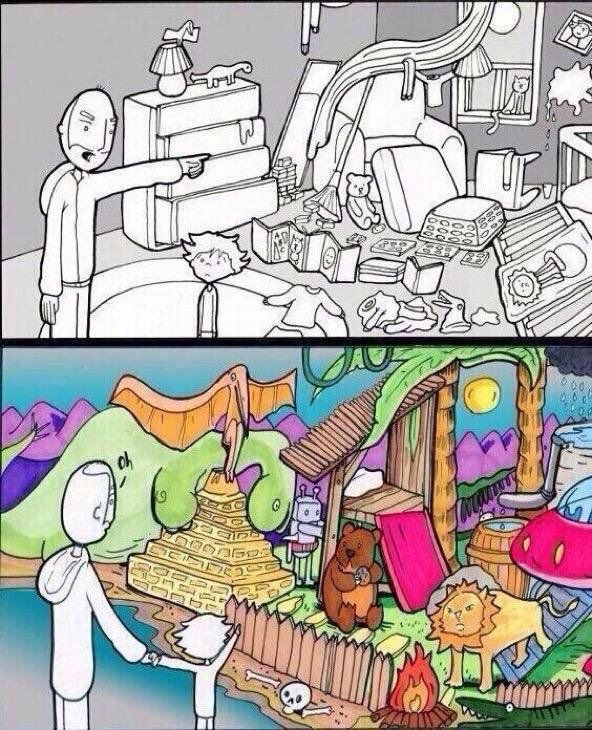 Embrace the imagination in your young men. Revel in their fury. Rediscover yours. I think society needs to find a way to empower our children while still teaching them social skills. I heard those same things (girl in place of boy) when I was a child. I also heard “you can’t do it you’re a girl” from my own parents. I’m glad that society is choosing to empower girls and women, but I am saddened that people seem to think that boys and men need to be disempowered for that to happen. All people have strengths and I feel that’s what should be nurtured and celebrated. The Feminist empowerment does so at its own peril. Those that choose a more traditional lifestyle are ridiculed and made to feel lesser. There is little acceptance in their narrow definition of what a woman should be. They say girls can be whomever they wish to be but the words ring hollow and hypocritical. We should be who we want to be. Those that don’t like it can lump it. If a young woman can pass the training course to be an Army Ranger, more power to her, but don’t denigrate the male who exercises his energy to do the same. By the same token, the man who stays home to nuture his children should not be subject to ridicule. I had to comment because your post reminded me of when my son played HS football. I remember thinking how I had spent so much time teaching him manners, to respect others, NO HITTING (of course)…. Them sent him out on a field with other young men who wanted to crush each other and I was cheering him on. A time and place for all things. Just as in my submission. In the early years of my marriage I was anything but submissive. Oh I think my inner sub was there but she was tied and gagged HA HA.. I would not allow her to come out. It is a new season in my life/marriage now I am letting go of the social norms and accepting all of who I am. This is why Grandparents are so important we see beyond the here and now. Enjoy the fury in your grandson. He will learn the time and place to release it and you will help him. Thank you for taking the time to comment. I understand the football comment well. I used to call it socially approved violence. Young modern gladiators. Then we all went home and celebrated. Next day it was “be nice” again. Strange conflicting messages. Thank you again for stopping by. I hope your are still tied and gagged as often as your Sir sees fit.